The Booster Bath — Is It The #1 Dog Bath Tub? Why Should I Use a Dog Bath Tub? What's Important In a Dog Wash Station? A perfect dog bathtub, or dog wash station, is the absolute cornerstone of a quality wash time spent with your dog. 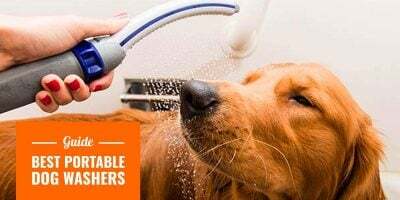 Most specialists recommend two to four complete washes a year for an average dog, and many more water showers especially if the dog spends a lot of time outdoors. Yet, many dog owners (including myself) find the dog wash a massive hurdle: either because their dog isn’t thrilled by it, or because there is no convenient area dedicated to this wash time. Too many do it in their own shower or bath tub, using a non-slip mat, but it’s not comfortable for both the dog and the handler. Investing in a quality dog bathtub will save you a lot of trouble over the next months, and years. A lot of old school dog owners will argue that point of using a dog-specific (or pet-specific) wash station and I can see where they come from. However, these old-school dog owners are the same who often own smelly dogs with matted hair. I am all-in for giving dogs what they deserve especially when the cost is far from scary. I used to wash my dog in my own shower and we were both feeling uncomfortable, I was bending my back, stooping over to reach the dog shampoo, etc. I ended doing it as rarely as I could just because it genuinely was a dreadful moment. The dog felt that and was a little panicked as if my Border Collie felt that everything was NOT under control. Once you own a proper dog bath tub or dog wash station, you quickly start to actually take pleasure in washing your dog and your dog will appreciate this bonding moment. Most dog bath tubs have a restraint system so your dog is kept in place, standing up and stable, but after a few washes, you won’t even need it anymore. That’s how much your dog will enjoy it. 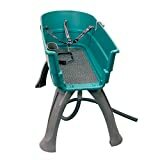 A quality dog wash station must offer enough space for the dog to feel comfortable but not too much. You don’t want your dog to start having a little sprint in the bath tub. Second requirement is a simple yet efficient restraint. Puppies need extra care and must be kept in place all times because they do tend to move a lot. Puppies jump, wiggle, wobble, and they can do it at any given time. They are too unpredictable to be left to their own devices. For your own back’s sake, invest in a dog bath tub that is elevated, not just a basin on the floor. Especially when used often, an elevated dog wash station will avoid you getting terrible backaches. No absolute need for a fancy adjustable dog bathtub, just make sure it is elevated. We wanted to create some sort of build up to the best dog bath tub but sorry, we are cutting the suspense. The best dog wash station is the Booster Bath. And yes, it is that clear. Made in the USA, the Booster Bath comes in three sizes with each manufactured with the suitable sturdiness. Tried and tested by veterinarians, registered breeders and pet professionals, the Booster Bath is loaded with useful and cunning features. From the bottom up, the legs are designed with sturdiness in mind, and also have rubber grips to keep the tub completely stationary on nearly any surface. The open-entry on one side facilitates the access to the dog during the washing and the hose offers a 360-degree access for easy bathing and drying. Once your dog is comfortable in its dog bathtub, he or she will enjoy the no-slip rubber mat and the adjustable leash restraint with removable collar. This is to ensure that the dog remains in position and does not escape or jump. As an organized wash station, the Booster Bath offers a shampoo caddy at a quick and easy reach. A nozzle hook is also available on the rim if you need to have some grooming supplies close by. If you move and travel a lot, the quick snap legs will save you a lot of time when assembling and dissembling the wash station. There is also a five-foot water exit line so you can use it indoors or outdoors, or even in your own bathtub if you want to just use the basin, without the legs. If you constantly are on the move, you may prefer a more mobile dog washing station. More than just a dog bathtub, this Flying Pig washing station for dogs is the ultimate grooming salon’s dog washing system. Just look at it, it is heavy, solid and professional-grade, made from premium high-density polypropylene. It is fully rust and tarnish-resistant. This washing station has been engineered specifically to lift all pets, even the heaviest while bathing and giving them all the care they need. The enclosure is high enough to prevent any pet from jumping over, even the most agitated. Yet, it is low enough for you to have full access to the dog and provide a complete wash. 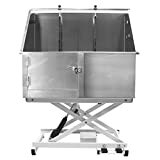 There is a foot-operated electric lift that can raise up to 220 lbs with no effort from your part and the tub comes with a removable door that lifts straight up for easy entry and exit. No need to carry the heavy dogs anymore, just bring the tub down, open the gate and here you are, ready for a professional dog wash. This premium dog bath system comes with four shampoo bottle holders, an overhead grooming arm, three black grooming loops, an elevated platform, and several drainage accessories and hardware. You are definitely ready to welcome any dog for any type of wash at any time. Make sure you have one of Flying Pig’s grooming tables or dog dryers too! Many people are happy with washing their dog in their own bathtub or shower cubicle; I am not. I wouldn’t spend few hundreds in a professional dog wash station but I am extremely happy to spend $100 or so in a light and super convenient dog bath tub. Like I said, the bathing time is now a pleasure, and it has not been like that for years.